Turkmenistan is situated in heart of Central Asia between the Caspian Sea in the west and the great Amu Darya in the east, from Aral Sea littoral steppes in the north to the Kopet Dag mountain range to the south. 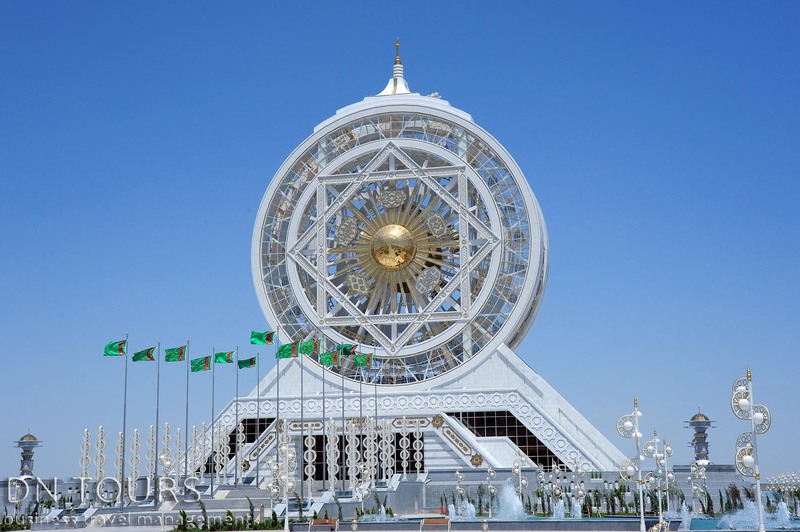 Turkmenistan is an independent state founded in 1991 after the disintegration of the USSR and five years later it attained a unique political status which was recognised by the United Nations Organisation. 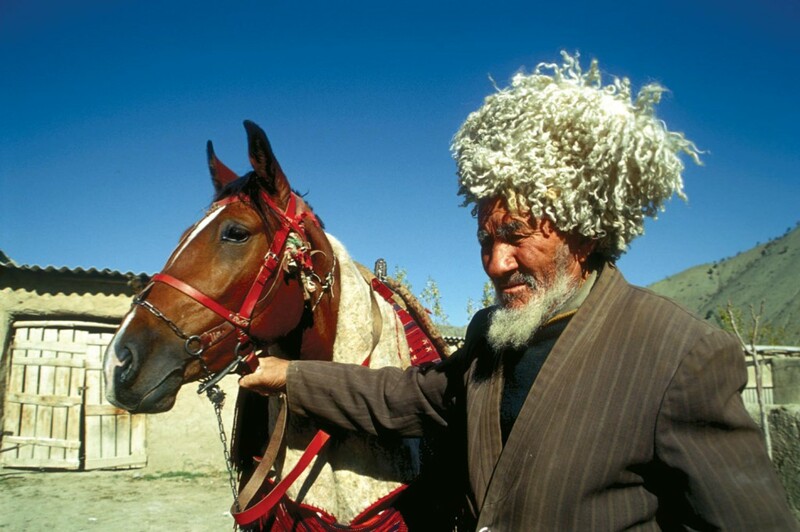 Turkmenistan is the country of original and diverse cultural traditions. For many travelers our contry appears as the land, having the ancient history, set of unique historical-architectural monuments and surprising natural sights. 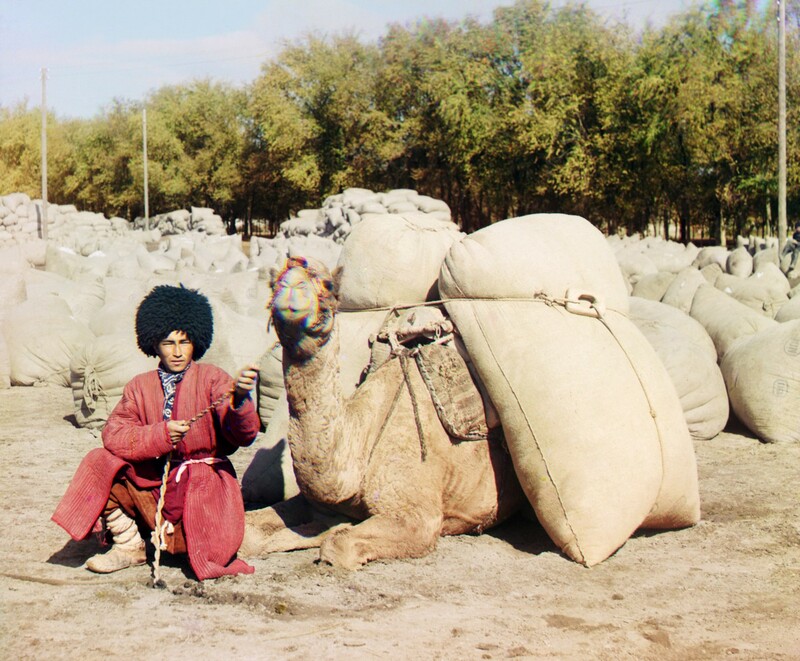 Turkmenistan is the whole epochin history of ancient international routes of the Great Silk Road. Caravans and diplomatic missions, travelers and piligrims, grandly striding on these routes, simultaneously laid the ways of rapprochement and mutual understanding between people. 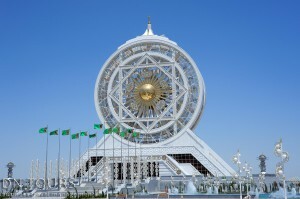 Turkmenistan is a real treasure for foreign travelers. Boundless Caspian Sea, majestic desert Karakum, mountain top of Kopet Dag, subtropical valleys of Sumbar, surprising underground lake Kow Ata, curative sources and amazing waterfalls. Turkmenistan is one of the least explored countries along the Silk Road, however, it has one of the richest cultural heritages in Central Asia. 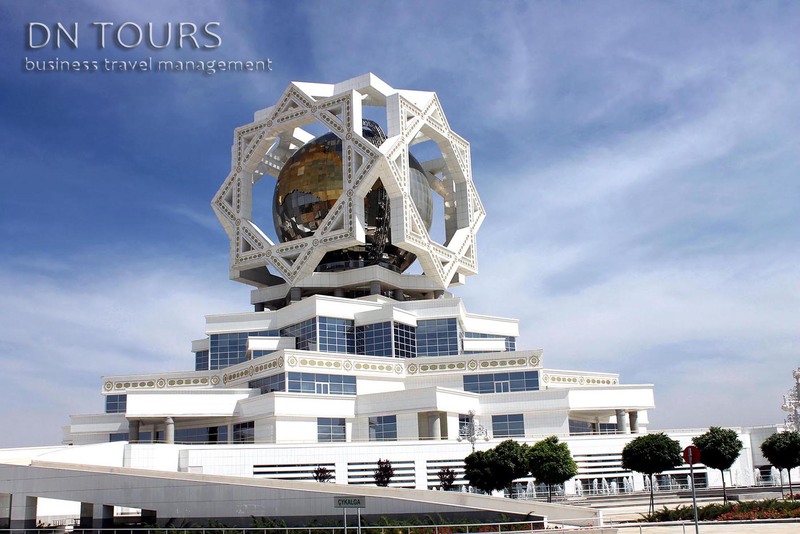 You will see interesting contrasts on this generally unknown desert country, you have modern Ashgabat with ist extravagant buildings, colorful bazaars and oriental atmosphere contrasted with the remnants of ancient cultures and impressive, fascinating desert landscapes. Immerse yourself in the milleni-old culture when Old Nisa and Ancient Merv and let yourself be enchanted by the Silk Road. 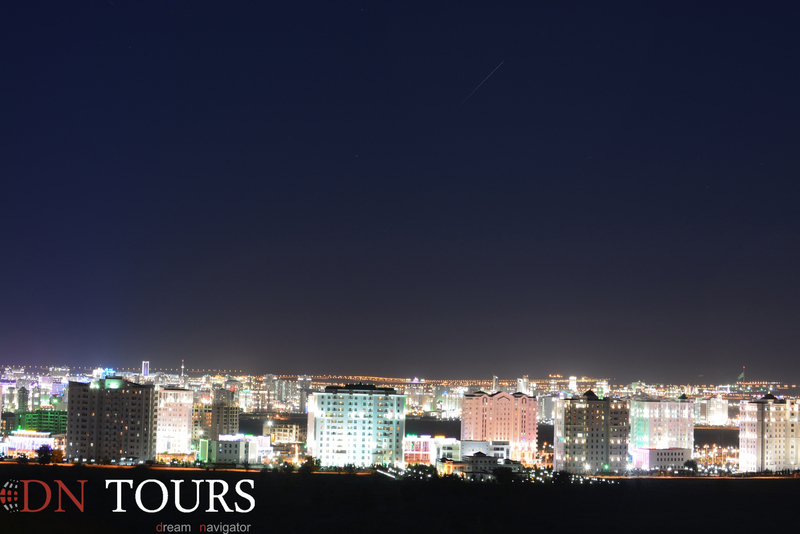 Last but not least, it is the people that make Turkmenistan such a hospitable country. 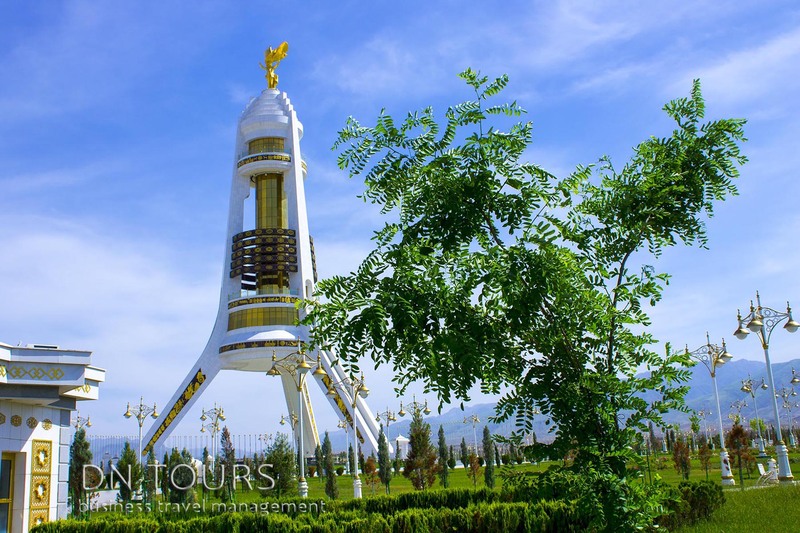 Ashgabat is located in a picturesque valley at the foothills of Kopet Dagh. It emerged in 1881 first as military fortress not far from a village bearing the same name. In 1885 a railway was built that reached the area. As a result, it turned into a small town. In Turkmen folklore, the name of the city is linked with the meaning “city of love”. According to legend, when ancient Nisa was under the rule of Nurahmed, and Anau was under the rule of Pirahmed, Allah put a ban on love. Against this prohibition, however, the daughter and the son of these two governors fell in love with each other. Realizing the threat to their safety, they hid themselves in the desert, until at last, parched with thirst, they walked to a mountain range, found a lonely spring, and ran to quench their thirst; it suddenly it dried up. The lovers traveled further, where they met a mountain river, but no sooner had they fallen to drink, it evaporated. Then the young man dug into the earth to reach underground springs, which made Allah angry again, and He sent Azrail, the angel of judgment, after them. However, God’s envoy failed to carry out the sentence: having looked at the girl, he fell in love and forgot his mission. Suddenly, a spring of the same crystalline purity as love itself gushed out of the ground. They decided to stay here, near the wonderful spring which saved their lives; and after hearing their history other people moved here as well. In the halls of new National Museum constructed after Independence the most valuable archeological finds related to ancient history of Turkmenistan are displayed. The museum’s collection contains dozens of man-made monuments of traditional craft creativity and a folk art of the 17th – 19th centuries. Weaving, embroidery, ceramics, carpet making, jewelry – here is far from complete list of artifacts kept in the museum. In total there are more than 2, 500 exhibits. The Capital Carpet Museum is considered a unique of its kind in the world. There some hundreds of the best carpets of all times are collected, the oldest of which is dated the 17th century. There is also the biggest carpet in the world which is about 400 square meters and weighs over a ton. The National Museum of History and Ethnography offers a magnificent collection of ancient artifacts collected from the entire territory of Turkmenistan including the ones found during excavations of Old Nisa. The basic centre of tourists’ attraction is a huge Sunday market “Tolkuchka” (secondhand market) which is famous for variety of goods and bright Turkmen traditions. Stretching for a few kilometers along deserted suburbs of the city, the market draws attention first of all by an opportunity to purchase traditional Turkmen carpets which are brought there from the entire country. The Ahal Velayat (region) is situated in the center of the southern part of Turkmenistan at the border of the Kara Kum desert its climate is sharply continental with hot and dry summers. The area of Ahal equals 98000 square km and its population is about 700.000 inhabitants. The Akhal velayat is an important industrial region of Turkmenistan, having such major industries as natural gas extraction and textile production (the biggest in the world factory of denim, knitted and cotton fabrics have been put into operation in recent years in Geok depe and Kaka), as well as the production of building materials. In agriculture the priority is given to cultivation of fine-fibered cotton vegetables and stock-breeding. 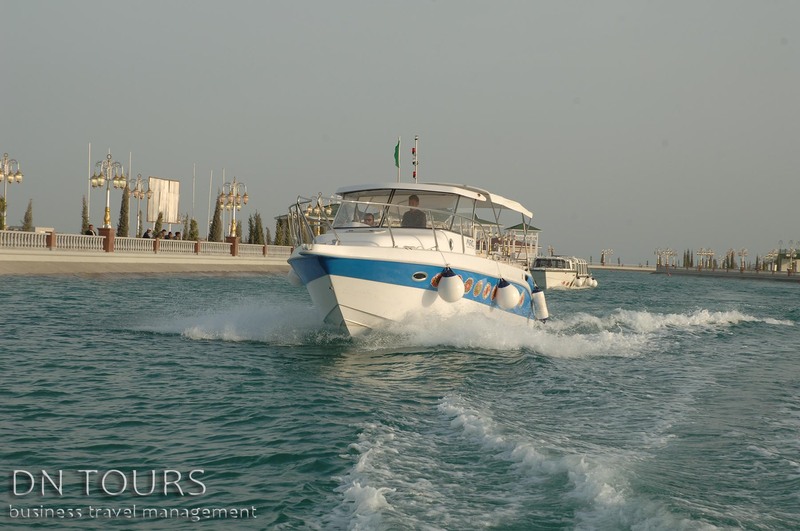 The tourist itineraries about the Akhal velayat are diverse and intresting, providing acquaintance with historical and architectural monuments of such towns-fortresses as Khivabab, Abiverd, the ancient town of Serakhs and pilgrim routs to the sacred places of Ak-Ishan, Dawgala, Zendi-baba, Kyrk-gyz, Archman-ata, Shekshi islam, mausoleum of Abul-Seyid-Meikhene and the mosque of Saparmurat Khadzha. Perfect rest and medical treatment can be offered at a hard resort of Archman known since the old times for its curative properties of radon mineral waters. Not far from the city Ashkhabad in a mountain ravine there are wonderful nice picnic in the open air and picturesque rest areas. The Akhal velayat is a magi Archabil and Gokdere where one significent and beautiful land can climb a mountain in a retaining successive ties company of skillful guide, with its ancient culture and nice a horse or go out for an aspiring to the future. The nature of Akhal is rich in tens of thousands of types of flora and fauna. Many of these types are unique and can be seen only here in Turkmenistan. The nature of Akhal is also a mighty source of material resources for the people living here. With every step in the desert you can feel the mighty breath of life. The nature of sands is not always favourable to man. But it is the living nature, existing in accordance with the laws that have been laid down for millenia. The conditions of hot dry climate, caused the development of unique forms of plants able to get at lifegiving moisture from the great depths, to stand still in its development for the period of severe whithering summer heat and to bloom wild and unstopable in the period of short lifegiving spring. In the common ecological system of desert, thanks to the sharp biological balanse many representatives of the animal world feel fine as well. 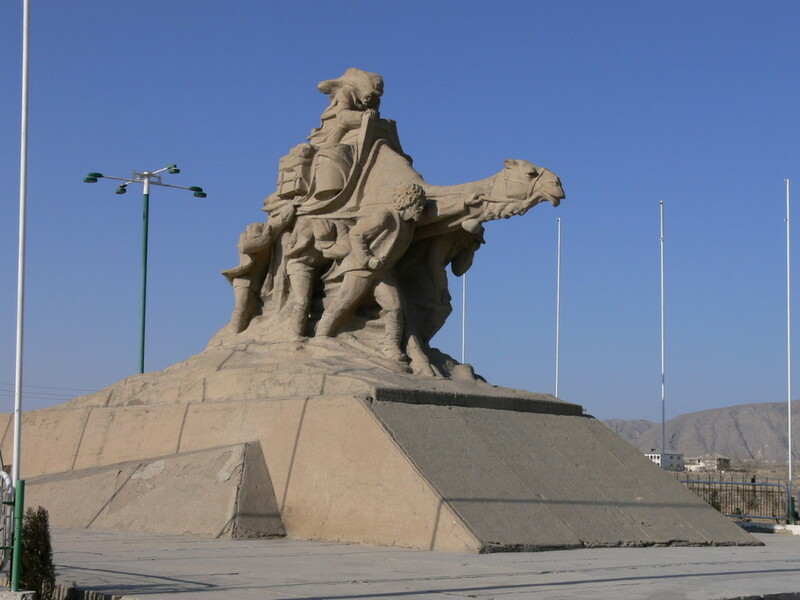 All these representative of the fauna begining from the crokodile of the sands – varan and ending with the ship of desert – camel – are unique mainly because they posess the surprising ability to acclimatization to the extreme climatic pecularities. And skilful and careful handling of life potential of the desert can also bring substantial profit to man. The desert ranges only allow grazing of multithousand herds of sheep and camels. But most brightly and completely the Nature of Akhal reveals its colourful variety . in those climatic zones, where there is an abundance of water, the basis of life. Vibrant Mooming of life rains in the cool foothills, in the river valeys, in the boundaries between different natural zones. But even today in the remotest places, hidden from accidental glances one can come across a porcupine, a red cat, a hyena and even a leopard. Mountain landscapes are not less characteristic of Akhal than those of desert. 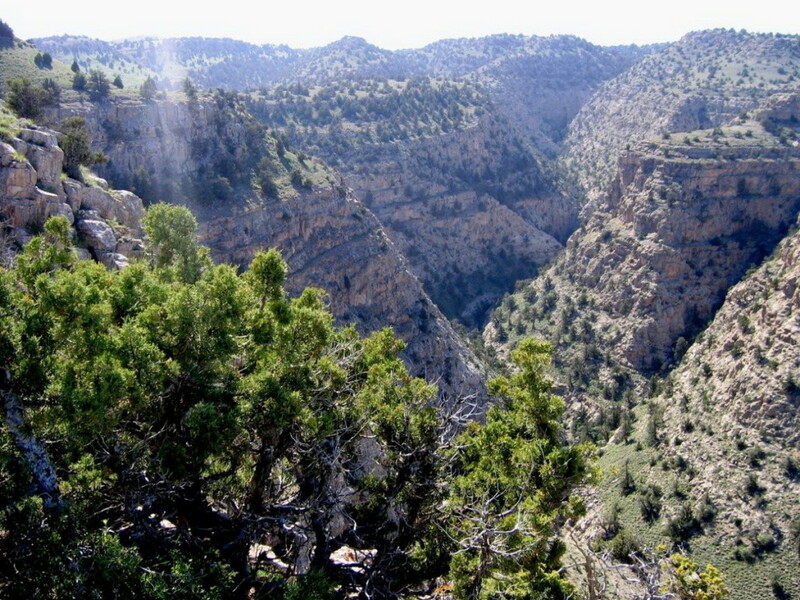 In the south there are mountain masses of the Kopet-Dag. If one goes the zigzagging mountain road, every new turn, every new step presents him with inimmitable beauty of canyons, slopes of mountains, alpine meadows, clean rivers and waterfalls. The mountain regions of Akhal is also an invaluable store-house of mineral resourses. The plant world of Akhal includes a lot of types of wild plants. The animal world of Akhal is represented by many types of vertebrate and invertebrate animals. In Akhal area there is also unique underground lake Kov-ata with warm hydrogen sulfide water. The cave is 250 m long, 65 m deep and 50 m wide. The water of this lake remarkably clean and transparent, having admirable amethyst colour. Turkmenistan’s main rivers are located only in the southern and eastern peripheries; a few smaller rivers on the northern slopes of the Kopetdag are diverted entirely to irrigation. The most important river is the Amu Derya, which has a total length of 2,540 kilometers from its farthest tributary, making it the longest river in Central Asia. The Amu Derya flows across north-eastern Turkmenistan, then eastward to form the southern borders of Uzbekistan and Tajikistan. Damming and irrigation uses of the Amu Derya have had severe environmental effects on the Aral Sea, into which the river flows (see Environmental Issues, this ch.). The river’s average annual flow is 1,940 cubic meters per second. Other major rivers are the Tejen (1,124 kilometers); the Murgap (852 kilometers); and the Atrek (660 kilometers). The Lebap velayat is situated on both sides of the Amu Darya river, having the Kara Kum desert on the left and the Karabil Hills in the North. The Kyzyl Kum desert lies to the northwest of the right bank of the river and the sands Sundukli are located in the center with the massif of Kugitang in the southeast. The area of velayat equals 94 thousand square km and its population is 1 million inhabitants. 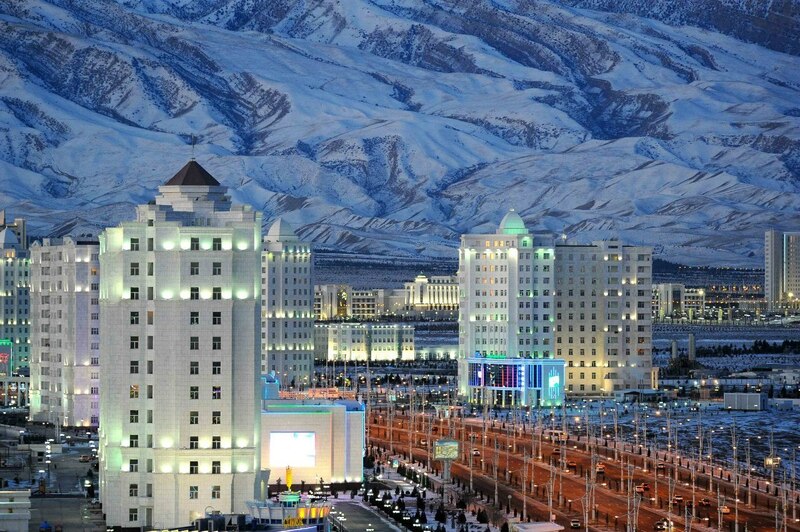 The capital town is Turkmenabat, other industrial towns are Atamurat, Govurdak and Seidi. The climate of Lebap is Sharply continental, doughty, with enervating hot summers and moderately could winters. Major part of the velayat territory is occupied by desert areas with poor vegetation. The main industries are gas, food, textile and chemical branches (the ammonium and carbamide works, a modernized oil grease factory in Turkmenabad). Animal husbandry and agriculture are also well-developed branches of the region. The Lebap velayat has good prospects regarding industrial and transport development. Among tourist itineraries about the Lebap velayat a trip to reserved places of Kugitang, magnificent mountain a mass known for luxuries primeval nature, unaffected by civilization and abundant in rare spices of animals and plants, will be of special interests. One can see here not only a sparking “Lunar Landscape” and “Plateau of Dinosaurs” with paw prints of the pre-historic reptiles, but also contemplate in reality wonderful pictures of the carts caves created by the Nature’s fantasy deep underground. Quite the opposite to the wealth of the plants of Kugitang will appear he Repetec snake reserve, one of the biggest in the world by variety of serpent species collected there. One can see in real a graceful deadly dance of cobras, proud predators of desert – varan lizards, Central Asian adders, gurzas, and many others. 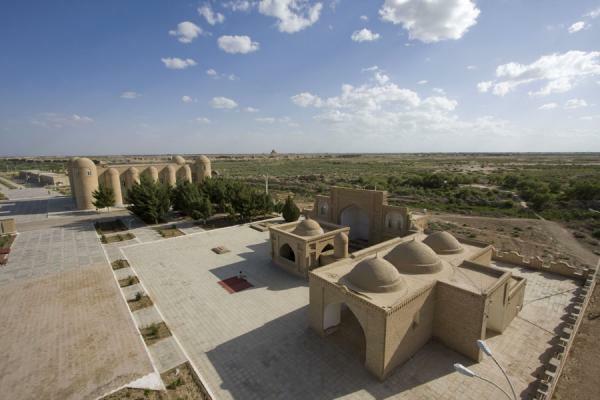 Besides, the Lebap Land also keeps many others secrets you can get in touch with just by visiting the town-museum of Atamurat with its ancient caravanserais, mausoleums of Alamberdar and Astana-baba which continue to be the places of pilgrimage for many believers up to now. Mary velayat is the southeastern region of Turkmenistan on the Turan Lowland, within the limits of the Karakum desert. The greater part of this region is represented by flat fertile lands and only the Urguz lowland that located in the north is occupied by saline soils of takyrs. To the west of the Tedzhen river, there in the plain of the Kopetdag Mountains connected in the south with the foothills of Paropamiz namely Badknyz Hills (1267 m above the sea level). The area of this region is 87 000 km2 and its population is 1.2 million inhabitants. The administrative centre is Mary city. The following branches represent the industry: production of electric power, mineral fertilizers, cotton fabrics, knitted articles and others. The first in the country sugar refinery has been recently put into operation in the city of Mary. Stockbreeding and plant-growing branches are considerably advanced in the area. 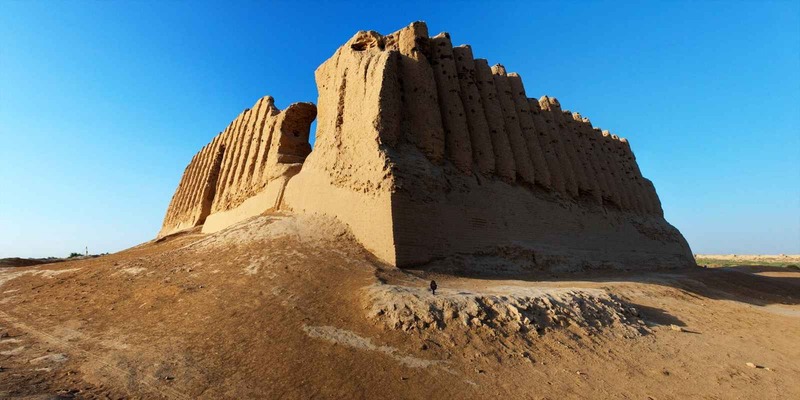 Mary historians refer to Turkmenistan territory as “the archaeological paradise” due to abundance of ancient burial-mounds, hiding inside the ruins of ancient towns. Mary velayat takes a special place in this respect. The main historical sight of this land is Ancient Merv. The excursion to Merv is like a magic travel in the time-machine back to II millennium BC. The images of the great past of Merv vividly appear in “Shakhudzhakhan” (Soul of Kings), city sites represented by ancient fortress walls, harmonious wonderful and ideally proportional mausoleum of Sultan Sanjar, the huge inverted cups – refrigerators, where people kept snow, which never thawed even in most hot summer. In addition, among the most impressing sights of Mary velayat are the ruins of the ancient country of Margush. One day its inhabitants left this place, following the Murgab River that had changed its bed leaving behind the monuments of highest artistic and cultural heritage. During the past decade of independence, Turkmenistan has been striving to attract from foreign tourists со give the country а wider international exposure. Recent years Turkmenistan has built several modern 5-star hotels on, the Caspian Sea coast and in the capital city, Ashgabat. Another important factor luring foreign tourists to this country is comparatively low-prices for accommodation and tourist services.» . In Soviet times, when Turkmenistan was а border republic of the USSR and practically closed to foreigners, only several hundred foreign tourists visited the country each year. Today Turkmenistan receives thousands of foreign’. tourists а year. 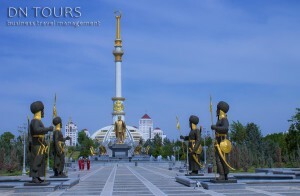 The main tourist attractions in Turkmenistan. are its ancient cities located in fertile oases Merv, Nisa, and Kunya Urgench. 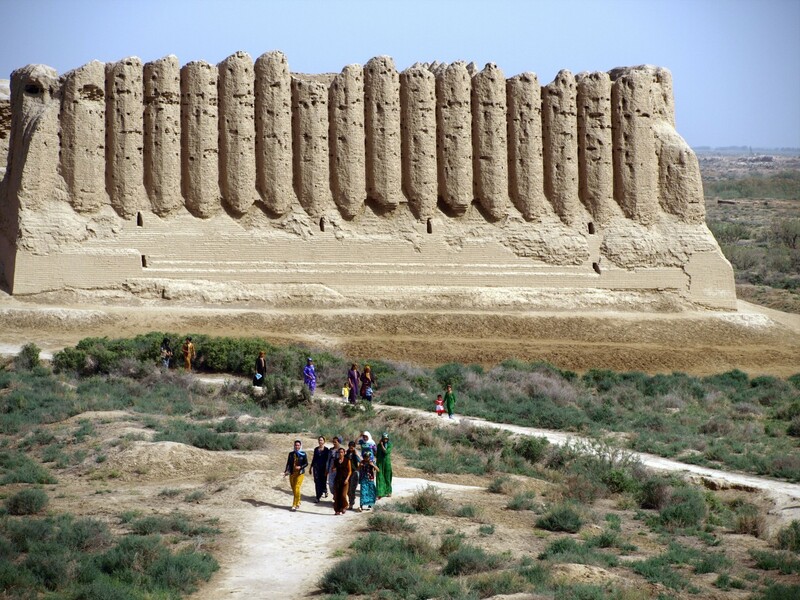 This story is about one of the most important ancient city’ s in Central Asia – Merv. Today, this large modern city is called Mary, and visiting it is а must in all tours in Turkmenistan. Water has always been the main wealth in this country which lies in the Karakum desert. Water means life and its absence means death and lifeless sands around. That green oases have always been sites of large cities, strong fortresses and caravan routes. Peasants traded food with travelling merchants in exchange for overseas goods, and warriors protected them from the devastating attacks of nomadic tribes. Life passed and revolved around water. The city of Merv emerged at the very heart of the paradise of the Murgab oasis surrounded by hundreds of miles of lifeless desert коте 3,000-4,000 years ago. In the 4th century ВС Merv was captured by Alexander the Great who renamed the city Alexandria of Margiana. In the 2nd century AD Merv was occupied by the Parthians who ruled the city for several centucaptured by many different conquerers, which in по way testifies to fortification – even today its high and thick city walls greatly impress tourists. The reason was that the city stood at а very convenient location at the crossroads of important trade and military routes. Merv was completely swept from the face of the earth several times, but always rose from the ashes. Iп 1222, Genghis Khan’s hordes slaughtered all citizens of the city, but Merv grew up again. After each devastation the city reemerged on а new site just а little aside from the old city site, often following shifts of the Murgab river bed. The strong endurance ancient city was explained by Allah’s favorable disposition towards this place. Merv has always been regarded by Muslims as one of the major holy places after Mecca and Medina. Right up to the present day thousands of Muslim pilgrims have and continue to соте to local mazars (mausoleums) to touch great sacred places and purify their souls. Sultan Sanjar, the last ruler of the Seljuq Empire. Unlike Christians, Muslims have only а few saints because the Koran prohibits the worship of anyone except Allah. So, those canonized by Islam are seen as truly great persons deserving great respect and eternal memory. Sultan Sanjar was one great man. Under his rule in the 12th century Merv reached the summit glory and power. Sultan Sanjar had conquered the territory of modem, Azerbaijan, Iraq, Afghanistan, Khorezm, and Kashgar. His fame and influence were во big that none of his neighboring rulers dared fight against him. When the Byzantine emperor invaded Anatolia and captured many Muslims (while Sultan Sanjar was wag-ing а war in the east of his (empire), the latter sent the emperor а letter which read, «If you do not release all captive Muslims |mmеdiately, all countries and people under my rule will invade Byzantine from all-sides. We will not take any prisoners and will cut off heads turn, the Byzantine or immediately freed all Muslims and assured Sanjar’s ambassadors that Byzantium would be keeping peace with the Seljuq Empire. Do not think, however, that Sultan Sanjar was canonized only for his feats. In his time Merv was not only an administrative but also а cultural center of the region. The city had а large library which held many thousand books and manuscripts. А great historian and geographer, Abu Said as-Samani, lived and worked in Merv under the Sultan’s protection. The great poet and astronomer Omar Khayam composed his immortal verses whilst working at the Sultan’s observatory. The Sultan patronized many scholars and poets of his time, for which they glorified his through the centuries. At Sultan Sanjar ‘s Mausoleum, you can read an Arab inscription: «This place has been ennobled with the remnants of he who was named Sultan Sanjar of the Seljuq Turks. Не was just, like Alexander the Great, and а patron for schol- poets…» Medieval travelers said that Sultan Sanjar’s Mausoleum was «the largest building in the world» and its blue dome could be seen «from а distance of one day’ s trip.» А 15th-century historian, Isfizari, wrote about the Mausoleum: «It is one of the greatest the world; it is so strong that corruption can not affect it.» In deed, the Mausoleum has sustained destructive earthquakes and survived until the present day without any serious damage. Another sacred place in Merv is the Mausoleum of Muhammed ibn-Zeid, а brother of the fifth Imam Muhammed al-Bakir and а descendent of the Prophet. Iп the Sth century he raised а revolt against the Arab caliph. Shi’ite Muslims who flocked under his banners proclaimed ibn Zeid their Itat, but in 10 mont the rising was put down and Muhammed ibn Zeid was killed. His body was crucified his head was cut off and sent to the caliph in Damascus. Today the Mausoleum is regarded as one of the greatest masterpieces of Islamic architecture. For a person who looks at a map of Turkmenistan for the first time it presents an uninterrupted desert. It is not surprising. 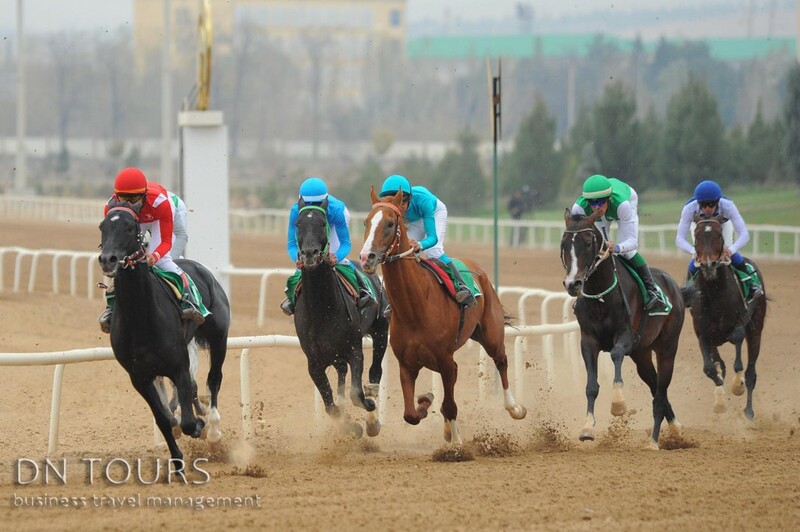 The substantial part of the total territory of Turkmenistan is occupied by Karakum sands. Still the first impression is sure to appear to be false, as not many of the countries can be proud of such a wealth of plant and animals kingdoms, such a variety of landscapes and climatic zones. The nature of Turkmenistan is rich in tens of thousands of types of flora and fauna. One cannot know nature of Turkmenistan not having visited the Caspian sea-shore. The Caspian sea is the largest in the world self-contained salty sea (lake) which has no connection with the world’s oceans. On the territory of the Caspian sea only one can come across flamingo, pelicans and many other birds who are on the list of endangered species (the Red Book). Special attention of the nature protection service is raid to preserving the populations of valuable sturgeon fishes. The next attractive spot to visit is restaurant is the State Reserve set up to protect the region’s 280 species of water fowl, marsh birds including flamingos, pelicans, indigenous colonies of seals or turtles. For anybody interested in seeing seals or turtles the reserve headquarters is on Naberezhnaya Street 42, where there is also small Natural History Museum. The desert ecosystems, dry subtropics, and marine shallow bays in the southeastern coast of the Caspian are included into the Khazar nature reserve. It consists of two parts, Essenguly and Krasnovodsk. It was set up in 1968 on an area of 192,300 ha. This nature reserve is included in the list of aquatic and wetland habitats of the international significance that are under protection of the Ramsar International Convention. 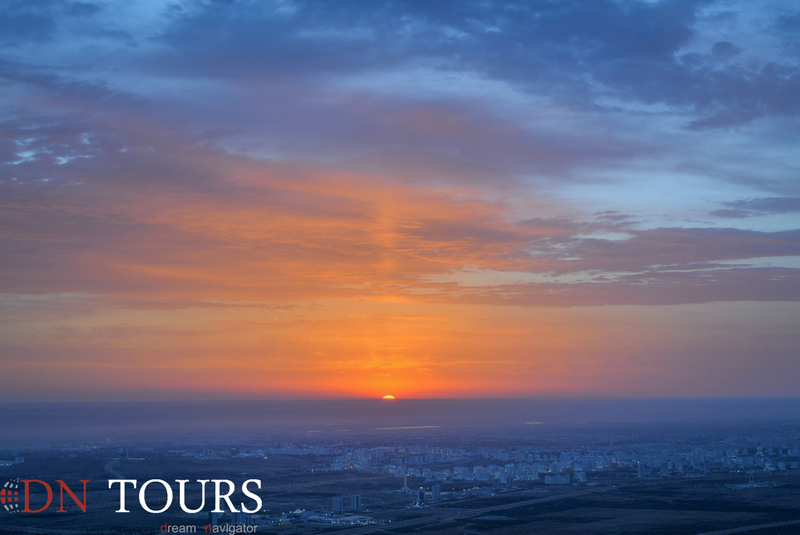 The Khazar nature reserve provides the habitat for 18 species of mammals and 372 species of birds. Of the bird fauna, nearly a half is waterfowl and near-water birds, which is a specific feature of the Khazar nature reserve (more than 85% of its territory covers the water areas, bays, and sea). Various subtropical vegetations including date palm are growing in the West valley of the Atrek River. But the Northern part of velayat lies on the deserts and has salty soils that named shors and takirs and they don’t have any grasses or trees. 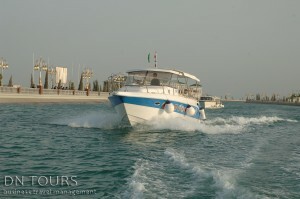 The golden and sandy beaches of the Caspian Sea, warm and soft water are splendid from July to November. Middle temperature in January is +4 C and in June it is +28.7 C, when in Yalta, the center of Krim are +3.7 C and +24.2 C accordingly. 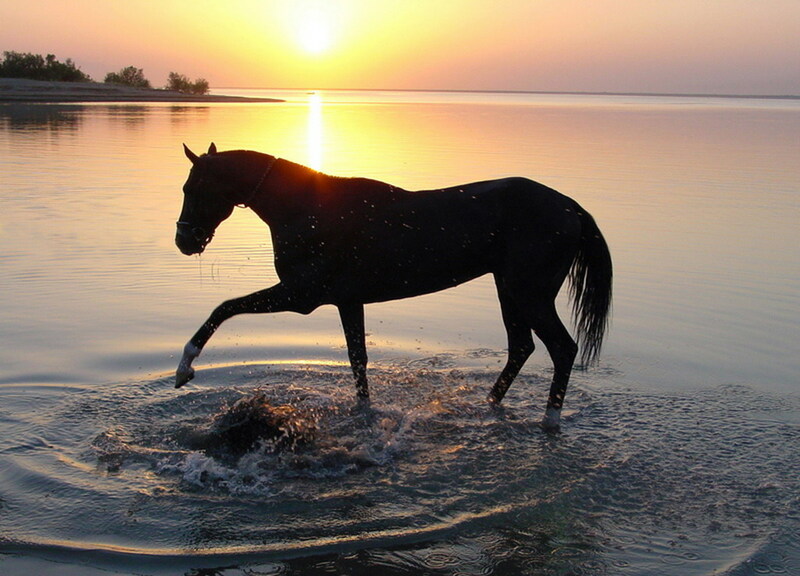 Turkmen section of the Caspian Sea is rich with oil, valuable sorts of fishes and waterfowl. Turkmen fishers and hunters live in the picturesque settlements, in the houses with whimsical architecture on the seashore On the Turkmen side of the Caspian Sea there are main sprawling places of the sturgeon sort of fishes. Pressed caviar, valuable kinds of fishes are essential production of Turkmen export. In the limit of Turkmenistan seashore the line extends for hundreds of km. There are big and small gulfs with “underwater forests” of different types of grasses, mollusks and crustaceans that are good food for migrating birds. For season migration, on account of ornithologists, about 12 million birds are flying and most of them for winter there. It is accounted that only the quantity of ducks are more than 400 000 and fine pink flamingoes are 10-18 thousand. On account of the specialists, local hunters let about 300 000 game birds every year but without ecological damages. That’s why hunting is one of the national Turkmen traditions. For keeping biological variety of the Caspian Sea Turkmenbashi reservation has been established in 1932. Balkanabat – the Center of Balkan Welayat. Balkanabat is an administrative center of Balkan velayat. It is situated at the Big Bakhan mountain foot and a big industrial and cultural center. It connects with all the towns in Turkmenistan by the railway, automobile and air transports and it is established as a center of the oil output. At an ancient time at the Big Bakhan Mountain foot there was lapping water of Balkan gulf in the Caspian Sea. Later it has disappeared and the Balkankhoja Lake is left only. There was a hill in the middle of the lake Nebitdag (Oil Mountain) and city has got its name from the place where the people putted out oil. In 1931 the first borehole having been drilled and it gave powerful fountain like eruption of oil volcano. At the seaside of these first boreholes and along the railway line the city has been constructed. It named Nebitdag. Later it was recalled Balkanabat. 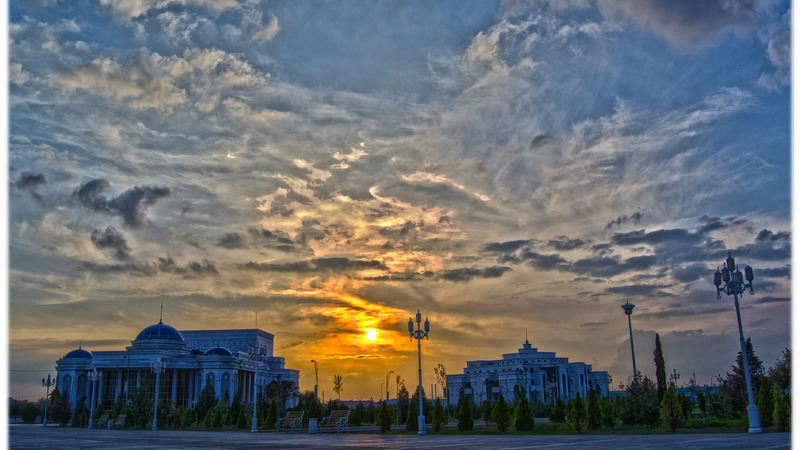 Balkanabat is one of the finest towns in Turkmenistan. It has clear planned scheme and its streets, squares and parks are as if drawn. The citizens get clean drinking water from the Yazkhan Lake. That’s why the city has turned into a green miracle in the middle of the deserts. Balkanabat is a capital of the oil-industry workers. 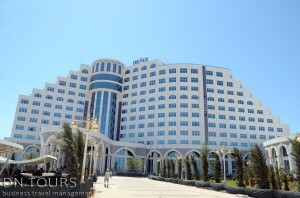 Numbers of the Turkmen and foreign oil offices and companies are functioning here. There are Oil Department of the Turkmen State Polytechnic Institute, colleges, Science and Research Project Institute in the town. Many historical and remarkable places one can see out of Balkanabat. To the east of the town archeologists have excavated two cavernous stands of people from the Stone Age – Damjacheshme -1 and Damjacheshme -2 have become standard statues of the Middle East archeology. The scientists established that the people from Damjacheshme having been domesticated goats and dogs twelve thousand years back To the West of Balkanabat there is a Jabel cave, remarkable archeological statue having been made by the people of Pal eolith and Neolith epochs. International resort Mollakara has a wild popular and it has been formed at the salt lake. The lake is and one can lie or sit in its water. Curative and mud water of the lake can treat the decease of the nervous system, digestive organs and gynecological and urine disorders. Salt lake Mollakara is one of the few lakes formed from umbers of chains of the Uzboi River’s old course. Earlier it having been crosses Karakum desert from the West to the East. This part of the Uzboi River was called Akatama. 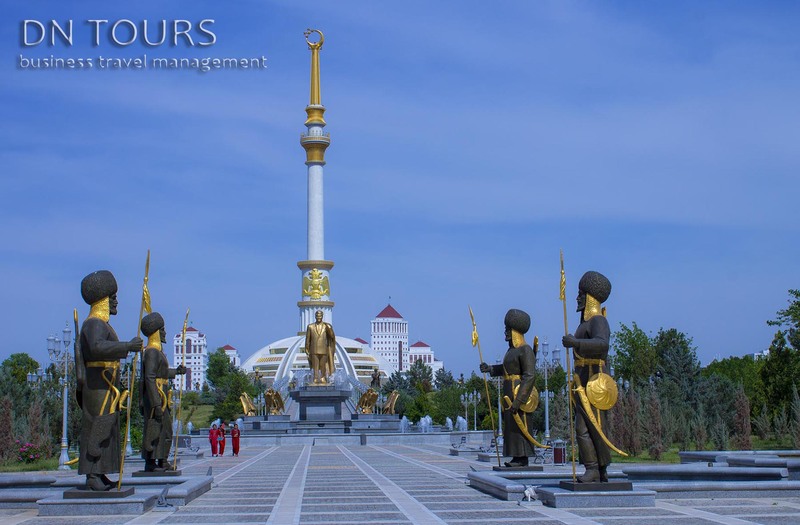 Turkmenbashi is the administrative centre of the Balkan region 560 km west from Ashgabat.It is the biggest port town with a very hospitable population of 70,000 people. The town is enclosed with low mountains and faces the Caspian Sea. 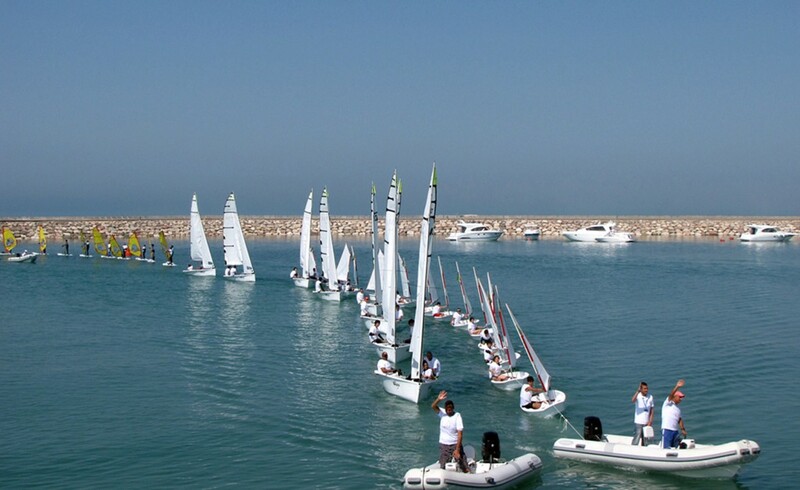 Avaza is the most popular sea resort center (10 km from Turkmenbashi) that is promising much in future. You are hardly to find the vacant local cottages for rent because of great flow of holidaymakers in summer time. 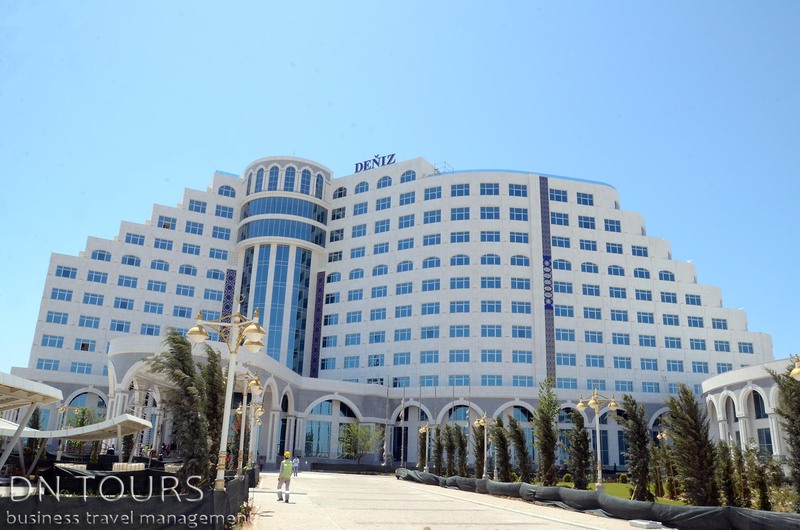 But you are always sure to find accommodation at fashionable “Serdar” hotel that is very close the purest, brilliant Caspian seashore (that is considered the biggest lake in the world). The short distance between Avaza resort and Turkmenbashi town will let you be a frequent attendant of town bazaar and local supermarket (on Shagadam street) where one can enjoy the abundance of great choice of green vegetables, fruits and famous sea products (crayfish, shrimps, sturgeon and caviar).You can also buy fresh fish from fishermen just on the seashore fishermen just on the seashore who can every mourning there. You can finish your town tour with an excursion to Museum of Regional History (10 minutes walk of the station). When you are back to Avaza to watch sunset and have the last swim of the day you can pleasantly finish your rest day in entertainment center of Florida next to “Tolkun” hotel (known as Turkish complex on the seashore). Only there you are can enjoy the wonderful and romantic sea view sitting exactly at the bar, you can also try your luck at Florida casino and taste delicious fish dishes in the restaurant. Balkan is an industrial developed region of Turkmenistan. Here oil and gas research, oil-refinery, chemical industries are in action. There are number of hydro-carbonic stores in Balkan velayat. Nowadays except Turkmen government oil and gas companies and enterprises such a big foreign companies as Mobile (USA), “Monument” (UK), “Petronas” (Malaysia), companies from France, Germany, Japan, China is functioning here. Karabogaz gulf is a unique big store of mineral raw material. 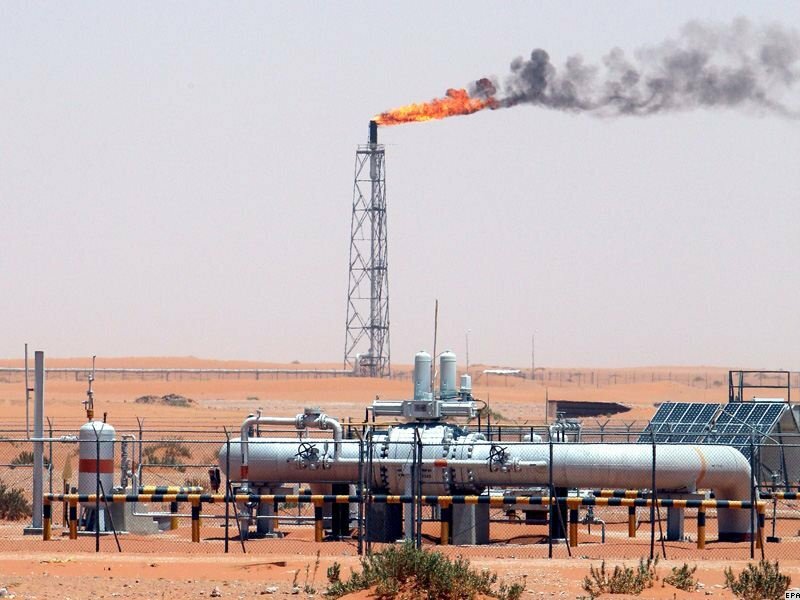 Scientists have accounted and proved that Karabogaz gulf has more than 48 milliard tones of sodium, magnum, potassium and brome salt but about third part of them are in brines, others in crystalline and accumulations. Today main object of output is Glauber’s salt (sodium sulfate), mirabilit. Having a rich geological and industrial potential and possessing various natural resources, the Balkan Velayat is one of the most prospective regions of the country. Since 1960s new fields of hydrocarbon raw materials, Ekerem and Kamyshlyja, broadened greatly the geography of oil and gas extraction in the Balkan Velayat. It came after gaining independence when, in accordance with the oil and gas strategy, the Turkmennebit State Concern began realisation of a large-scale programme for strengthening the raw materials basis of the national fuel and energy complex at the expense of putting new prospective fields into operation. The Turkmennebit State Concern steadily increases hydrocarbon production. In January-February 2007, over 1.116 million tonnes of oil was extracted at the oil fields in western Turkmenistan. In the period, over 1.3 million tonnes of oil that is 100,000 tonnes more compared to the same period of 2006 was supplied to consumers. 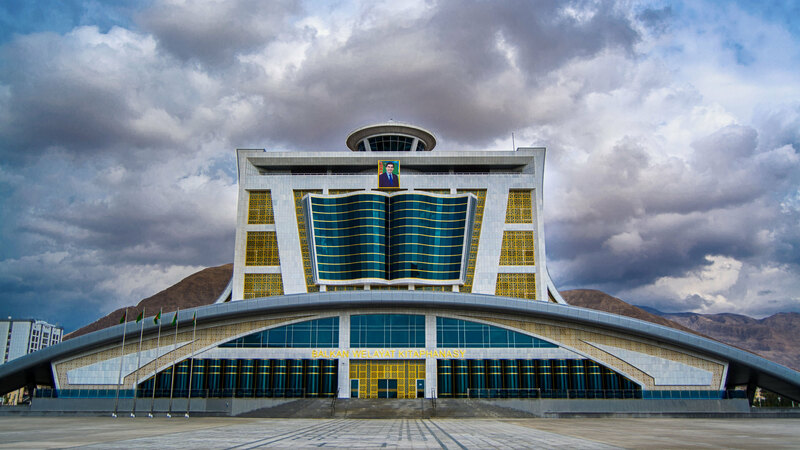 The Turkmennebit State Concern supplied 957,500 tonnes of “black gold”, that is 110,000 tonnes more compared to the same period of 2006, to the leading enterprises of Turkmenistan’s oil industry – the Turkmenbashi complex of oil refineries A new oil-gathering station built by the company Dragon Oil (Turkmenistan) Ltd carrying out development of the off-shore fields in Turkmenistan in the Cheleken contractual territory is being prepared for putting into operation at the Caspian Sea shore. The capacity of the complex intended for preparing tank oil, storing, transporting and shipping raw materials is 50,000 barrels (6,666 tonnes). The oil and gas complex of the south-western region is to play a significant role in the new energy strategy of Turkmenistan worked out with consideration of the tasks set for the economy in the third millennium. As President Gurbanguly Berdymuhammedov said during his visit to the Esenguly Etrap, the amounts of geological prospecting work, geophysical investigation, deep prospecting drilling whose efficiency will be provided by advanced technologies and up-to-date equipment, would be greatly increased. In accordance with the Strategy of development of the oil and gas industry of Turkmenistan until 2030, prospecting work and additional exploration aimed at discovering new oil- and gas-bearing strata will be carried out in Akpatlavuk, Chekishler, Shatut, Nebitlije and other deposits and prospective fields. The Dashoguz velayat equals 73 000 square km and its population is 1.1 million inhabitants. It is situated in the northern part of Turkmenistan on the left bank of lower Amu-Darya, in the desert Kara Kum. The northern part of the region is occupied by the ancient delta of the Amu-Darya river., the Sarakamysh hollow with a lake, and the southeast part of the Ustyurt plateau. The administrative center is the town Dashoguz. The climate of Dashoguz velayat is sarply continental with hot and dry summer and relatively warm winter. The territory of this region is covered mostly by sands with a rather poor vegetables represented by haloxylon, sedge, and wormwood. The industry is represented mainly light and food branches (among major enterprises here are a new cotton spinning factory and a textile complex in Dashoguz), as well as production of building and construction materials. In the field of agriculture this is a big supplier of cotton, vegetable, fruits, gourds and grain cultures. Animal husbandry is also well developed. Among historical and cultural monuments of Turkmenistan the Dasoguz velayat occupies a special place due to unique architectural pears of Orient situated on the ancient land of Kuneurgench. The biggest diamonds in the diadem of religions buildings Kuneurgench in the first place are represented by the mausoleum of Turabek-Khanim and the minaret of Kutlug-Timur. However there is hardly anyone who would remain indifferent viewing and feeling the majestic and magnificent power of fortress of Devkesen, Shasenem, Izmukshir, Kenevas and others.